One of the most beautiful natural sights in Estonia is the Taevaskoda. One of the most beautiful natural sights in Estonia is the Suur Taevaskoda. 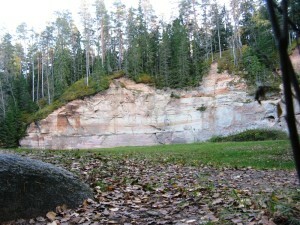 The sandstone cliff rises 22,5 m from the river surface, the total relative height of the sandstone wall is up to 38 m.
The Taevaskoja Holiday Centre is located just 700 m away from the Suur Taevaskoja sandstone cliff. A few decades ago people liked to carve their names into this massive wall of sand, even though it was and is against the law of nature protection. Some of them have remained there to this day. However, most of them have been washed away by water. Moving slightly upstream from the Suur Taevaskoda, you will find a big boulder by the name of Nõiakivi – Witch’s Stone, also known as the Spy’s Stone (Salakuulaja kivi). The legend says that an enemy spy, sent to listen in on the talks of the folk leaders, had hidden himself behind this boulder and as a punishment for his actions, he, too, was turned into stone. Another visitors’ favourite is the Väike Taevaskoda. Its sandstone cliff is up to 13 m high. Natural springs have carved a cave into the wall, which has been named the Neitsikoobas – the Virgin’s Cave. Many scenes for the “Viimne Reliikvia” movie were filmed around the Väike Taevaskoda. Historians believe that the cliffs have been named Heaven’s Hall (Taevaskoda) because Estonians believing in the Taara God used to hold their meetings there. The legend however says that the Vanapagan (Old Devil) had been so enchanted by the place’s beauty, that he had built various rooms underground here and named them the Heaven’s Halls. 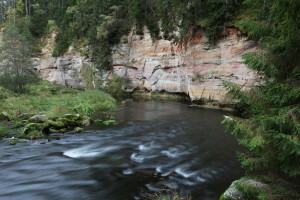 The river flowing by the Taevaskoja cliffs is called the Ahja River, and it is one of the most popular rivers for canoeing and kayaking in Estonia. The nature in Taevaskoja is beautiful and fascinating. It is said that every proper Estonian must visit the place at least once in their lifetime. To get the most of the area, you should spend more than just a day here.